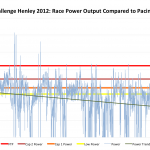 No race review is complete without examining the data collected over the event. 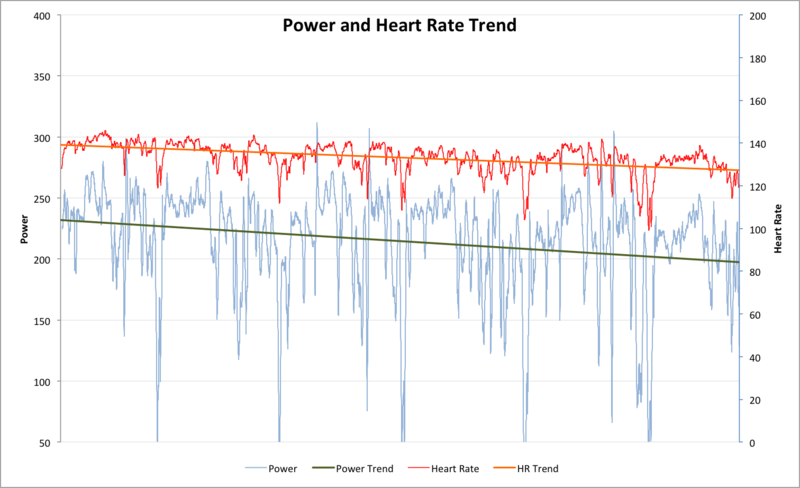 Power, pace and heart rate give me a good indication as to what happened during a tough day out. After a month without training I had no idea what to expect – I was racing blind. With no real sense of fitness I followed my default race plan, acting as if I was properly prepared. Unsurprisingly I wasn’t at my best, but I was capable of more than anticipated. 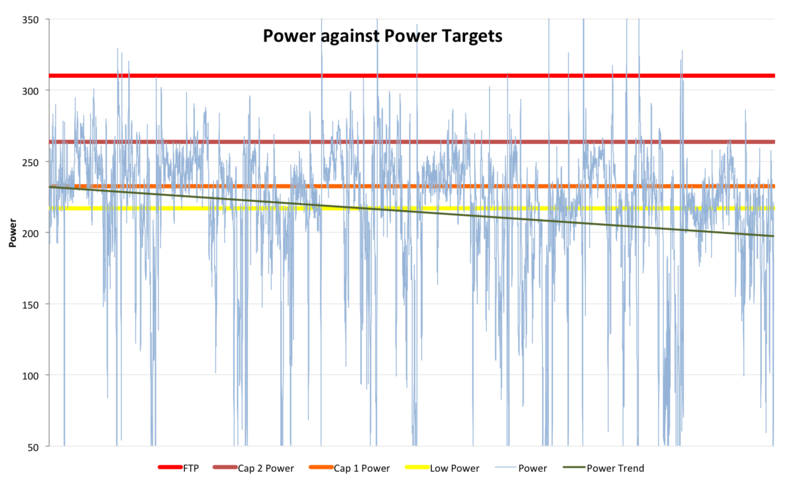 I’d set an aggressive power target of 240 Watts, particularly ambitious given the recent lack of cycling. This number was my motivation, feel ultimately dictated my performance, but I was watching and attempting to hold that target. The first lap was easy – 240W was no challenge, but I would pay a price later on. 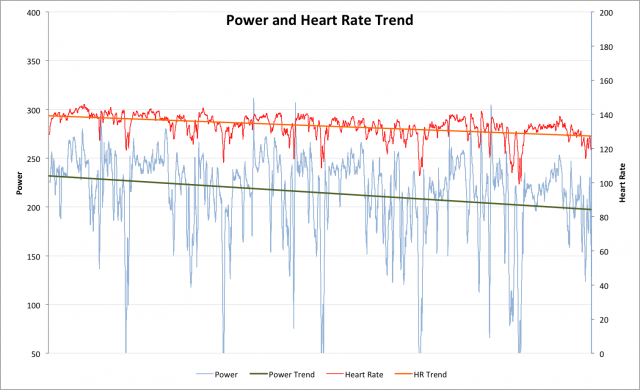 Declining power and heart rate are a clear indication of fatigue – my legs couldn’t sustain the effort and intensity dropped. By the third lap I could only just hold on. In view of my pacing targets and power caps it’s clear I pushed the first lap too hard. I didn’t cap myself, but drifted around 240W. Whilst spikes in power were minimal (out of the saddle efforts in the final lap produced more), the amount of time above my primary cap was too high. I knew I was pushing, but with my heart rate under control and feeling good I went with it. Perhaps with a better lead in I could have held it, but clearly the fitness wasn’t there. Had I genuinely capped my effort, I suspect my performance would have been even over the entire race. Despite the decline I wasn’t overtaken, I suspect most people were suffering similar effects at those later stages. I was consistent, spent little time coasting, but used downhills for more recovery than I’d planned. Again it’s most visible in the final lap, fatigue sees me resting on the descents. Perhaps it helped save my legs for the run. There is good and bad in this ride. In many respects it wasn’t a performance I’m proud of; it was painful and hard. I don’t know how well I would have performed after my usual taper, but I’ve no doubt that a month off significantly impacted my race. I made pacing errors though, I lacked the confidence to truly cap at my goal and tried to bank extra watts early on. You cannot bank watts, the cost of pushing early is too high. A huge surprise. 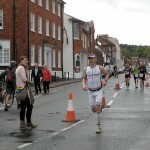 After walking to a 4:10 marathon at the Outlaw I wasn’t expecting much from Henley. That lack of training would surely make me suffer and the way my legs felt coming into transition I couldn’t imagine running. I’d altered my race plan – aiming for a slower pace and short walks through aid station. Unlike the bike I stuck to the plan, as I chased someone out of transition I made the conscious decision to let them go. I pulled my pace down to 5:00 min/km and intended to hold it there. That pace was optimistic. Throw in aid stations and a few seconds for walk breaks and the average speed drops. Then there are three notable breaks – two stops at Portaloos and a final walk break before the push home. Time lost, but each break left me feeling better able to run again; that final walk was added to help me finish strongly. An optimistic push at the 30km mark didn’t last long, but after the break I was able to lift my pace for the line. 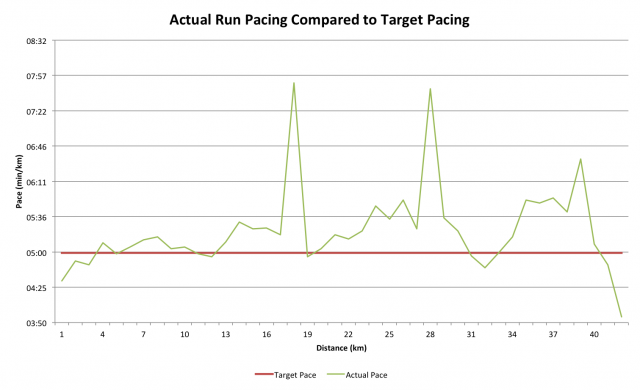 Considering the near total lack of running in the previous month an improved marathon performance wasn’t expected. The pace was pedestrian, barely taking my heart rate to 135BPM, but it took its toll on my legs. Pains similar to the Outlaw were present, the consistent, slower pace made them more manageable. 3:45 for a marathon is a step in the right direction, even if I’ve a long way to go to my old form. Being able to do that on this season’s minimal running is a positive. Before the race I commented that if I performed well this unorthodox taper would give me a lot to think about. I performed reasonably. I have no doubt not training for a month is far from ideal, it impaired my race day performance. I am surprised that it didn’t do more harm; there’s clearly a deep level of fitness that can get me round an Ironman in a respectable time. There’s probably room for me to do less in my regular taper periods. I need structure and training leading into a race, but perhaps not as much. Overall – I badly paced the bike, started too hard and paid later. However my run pacing was on target and proved effective despite the poor preparation. I don’t need data to know the swim was bad and leaves a lot of catching up to be done.